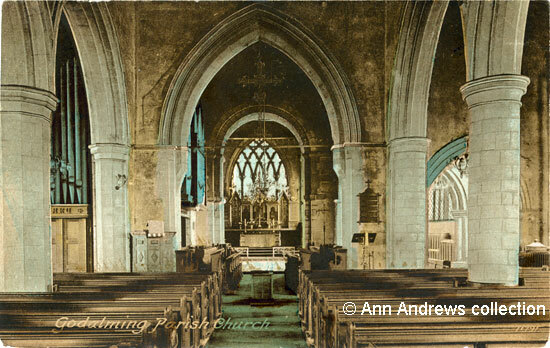 Here are two very similar images of the parish church, taken some 18 years apart. The photographers were looking down the nave towards east window and the high altar. Just before the crossing, on the left, is the pulpit which dates from about 1600 and the organ can be seen between the columns on the left. There are screens on the altar although they are difficult to see. The screen in the 1904 picture above is rectangular and slightly obscures the east window whereas the one shown in the 1922 image below covers even more of the window. It is an ornate screen with seven sections: the centre three contain religious paintings, with carved panels on either side. The outer panels may contain texts but it is impossible to tell from this image. In 1911 a Miss Alice Jane Heath of Hove bequeathed £1,000 for the erection of a reredos in the parish church so it is likely that it was this screen. Kelly's Directory of 1924 records that the east window, which has five lights, "is stained and there are others, including one erected in 1893 by J. Whately Simmonds esq. in memory of his wife, and another facing west in memory of Robert Edmund Mellersh, who died Feb. 4th 1893, dedicated by his wife, Sarah Ann Mellersh; there are monuments to the Elyott, Webb and Oglethorpe families, and one to the Rev. Owen Manning B.D. formerly vicar of this parish who, in conjunction with William Bray esq, F.S.A, wrote a history of Surrey, published in 1817 [sic, it was published 1804-14] ; he died 9th Sept. 1801 ; there is also a coloured tablet, erected in memory of Frank Bertram Bond, aged 19, 2nd Lieut. R.F.A. killed in the battle of Piave, Italy, Oct. 24th 1918 : there are three memorials to the men who gave their lives in the Great War, 1914-18, viz. : a stone panel on the outside wall of the south aisle, a cast iron tablet in the interior of the church and a cross in the churchyard". The Rev. Owen Manning, B.D., had been preferred to the vicarage of Godalming and rectory of Peperharow in 1769". He was buried, aged 81, at SS. Peter & Paul on 14 Sep 1801. Judeth Elyott's alabaster memorial is dated 1615; it is within the communion rails and shows a kneeling figure. The plaque dedicated to Philip Webb, who was M.P. for Haslemere, is dated 1756. Following the major restoration of 1840 the church held 1,804 adults and children. We learn something of what it was like from the Rev. E. J. Boyce, who took sole charge of the parish shortly after a restoration and enlargement that had cost £3,700. "Huge galleries were erected around the nave and in both transepts, by the transformation of the cruciform external appearance into that of a parallelogram, and by a system of pews which left no passage wider than three feet, those in the chancel being brought to within that distance of the altar itself". As Boyce also commented, the fine old, well-proportioned parish church had been turned into a meeting house. Little wonder that the reverend Secretary of the Incorporated Society, who had granted £500, reacted with a look of astonishment and dismay when he was shown "such barbarism" a few years later. Boyce described how he lifted up his hands and exclaimed "Is this the work for which we gave so much money?" The exterior was not unscathed as it had been encased with stucco. Yet somebody had thought it a good idea. 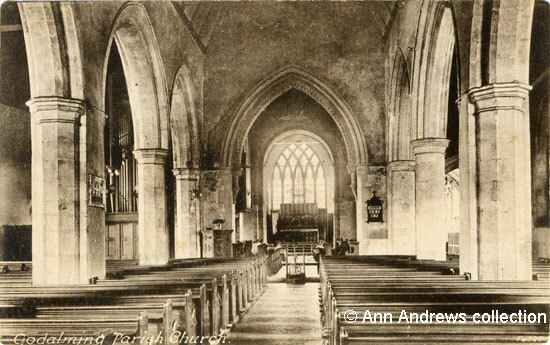 Boyce also records in 1869 that the chancel was being restored by the Ecclesiastical Commissioners. Further work was undertaken in 1879 by Sir Gilbert Scott and a good deal of the earlier work was improved and redone. The galleries were removed so there were less seats, but it was far less crowded. A new organ, costing £1,400, was installed in 1887 and the number of seats had been reduced to 1,000 by 1891 with half of them being free. The modern church, apart from a few additions, is the result of Gilbert Scott's work. In July 1925 the esteemed members of Surrey's Archaeological Society met at Guildford station and were driven to Godalming Church. A paper on the history of the church was read to the assembled group by the local architect Mr. Norris, who subsequently informed the group that the only duty that remained to them was safeguarding what had been handed down to them. A wit writing for the local paper observed that "the archaeological soul was in many ways revolted at the sight of a church worker assiduously erasing the inscription on one of the brasses in her efforts to polish it"! Lastly, although his memorial at SS. Peter & Paul is of a more recent date than these images we must not overlook General James Edward Oglethorpe, whose father had bought Westbroke Place before he was born. General Oglethorpe was both a military commander and a civil administrator in the eighteenth century. He became an M.P. but is perhaps best known in Godalming as the founder the US state of Georgia. He passed away on 30th June 1785. A modern, oval, memorial plaque commemorating the 250th anniversary of Oglethorpe's departure for Georgia in 1732 was unveiled in the church in 1982 and a flag of the US State is displayed alongside the plaque. 1. Godalming Parish Church. Published by F. Frith & Co. Ltd., Reigate, No. 54686. Printed in England. Registered 1904. Not posted. 2. Godalming Parish Church. Published by F. Frith & Co. Ltd., Reigate, No.71791. Registered 1922. Not posted. Kelly's Directory of Surrey, 1924. The Simmonds memorial is in the angle of the south aisle and chapel. There is more about the family on SS. Peter & Paul Parish Church and Church House, 1907. Robert Edmund Mellersh was a banker and solicitor who lived at Deanery House on Church Street. He and Sarah Ann had a large family. "Reading Mercury", 21 September 1801. Owen Manning's will was proved in the Prerogative Court of Canterbury on 6 October 1801 (PROB 11/1364/49). His widow Catherine died and was buried at Dorking in 1822. There is more about Rev. Manning on SS. Peter & Paul Parish Church and Church House, 1907. Frank Bertram Bond was the son of Bertram William Bond, a Medical Practitioner, and his wife Elaine Kate. The family lived at The Square, although were on Peperharow Road when Frank was born. He was killed on first day in action, in the 2nd battle on the Piave, at Maserada, while commanding left section of 31st Bty. 35th Bde. 7th Div. and is buried at the Giavera British Cemetery, Arcade (from the Commonwealth War Graves Commission). "Bath Chronicle and Weekly Gazette", 7 December 1769. Owen Manning's preferment. The living was then worth 300li. per annum. Kelly's Directory of Surrey, 1891. "Post Office Directory of Essex, Herts, Kent ..." (1855), Part 1: Counties & Localities, pub. Kelly & Co., Old Boswell Court, Temple Bar, London. "Surrey Advertiser", 27 July 1867. Godalming. Church Building in the Parish - extracts from a paper written by the Rev. E. J. Boyce. The Rev. Edward Jacob Boyce, Vicar of Godalming, was preferred to the Rectory of Houghton, HAM in 1865. "Chelmsford Chronicle", 22 July 1785. James Oglethorpe died, aged 102 according to the newspaper, at his home in Essex - Cranham Hall. He was actually born on 22 Dec 1696 and christened the following day at St Martin-In-The-Fields, so the age given in the obityary was incorrect. He founded the new colony of Georgia in 1732, taking 6,000 people [this number varies in different reports] from Great Britain and Ireland, at his own expense, to become the first English and Irish inhabitants. After a time, others emigrated there from all parts of Europe. By the time he left he had endowed an orphanage and set up an endowed school for the maintenance and education of poor children. He was buried at Cranham on 13 Jul 1785. Another plaque, near Godalming Museum, records the 300th anniversary of his birth.